The Fine Gael-Labour coalition government is under fresh pressure to launch a full public inquiry into the banking crisis in the wake of the tapes scandal. In the leaked conversations, Anglo chiefs are heard admitting to pulling critical balance sheet figures ‘out of their arse’. The comments were made in confidence as a financial implosion loomed over their bank and the the entire Irish banking sector in 2008. The conversations between former Anglo chief executive David Drumm and senior executives John Bowe and Peter Fitzgerald reveal how they belittled and blackmailed the state’s Financial Regulators, Central Bank and government officials. Most embarrassingly, one of the trio mocked Germany after it was forced to become involved with a clownish rendition of ‘Deutschland, Deutschland, über alles’. 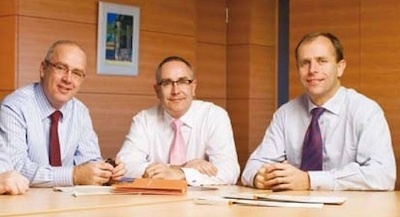 The adolescent and boorish exchanges confirmed that the notorious ‘cowboy capitalists’ of the once high-flying bank were focussed entirely on escaping the cost of their own disastrous mismanagement by exploiting and defrauding the state, by deliberately downplaying the extent of the crisis to the Central Bank and government ministers. It also emerged this week that the Gardai had the tapes in their possession for the past four years, but had inexplicably refused to take action. The source of the tapes remains a mystery, as does the timing of their release, years after the event. Television and radio talk shows have been inundated all week with phone calls from furious members of the public who were left in debt because of the financial downturn or have suffered the effects of five years of relentless austerity. The main opposition party has again became the target of criticism over its role in the collapse. Fianna Fail, currently the most popular party in the state, remains most associated with the ‘golden circles’ within Dublin society which fueled the property bubble and the wheeling-and-dealing banking culture -- before ultimately making the Irish taxpayer liable for their losses through the repeatedly extended bank guarantee. But, with Taoiseach Enda Kenny in Brussels, it was Labour’s Social Welfare Minister Joan Burton who was on the receiving end of opposition criticism today. Socialist TD Clare Daly and Sinn Féin’s Dublin Central TD Mary Lou McDonald led the assault in the Dáil this morning over her government’s role in not making Anglo’s bondholders (lenders) liable for their investment losses -- and for paying millions to the bank chiefs long after the failed bank had been nationalised. Ms McDonald asked why Labour’s Ministers allowed the Anglo chiefs “who treated the State with such contempt” to remain in position for five years, on salaries of hundreds of thousands of euro per annum. “Labour and Fine Gael have been in government for nearly two and half years yet not a single banker has gone to jail for bankrupting the State.... Not one of them has spent a day in prison. At the same time it’s response to the plight of struggling homeowners has been heartless”, she said. And speaking at the launch of the Sinn Féin summer school in County Cork today, Sinn Féin’s Finance spokesperson Pearse Doherty said the tapes revealed “a concerted effort by Anglo executives to defraud the Irish state. “People are rightly seething with anger and want these people to be held to account,” he said. “A whole generation” of young people had been forced to emigrate because of the actions of bankers, developers and the policies of Fianna Fáil and Fine Gael led governments, he added. For the Taoiseach, the affair was clearly a deep humiliation as he attended an EU summit in Brussels. Mr Kenny said the tapes “came as a thunderbolt” and had underlined the need for a parliamentary inquiry. “They show the contempt and the arrogance and the insolence of senior personnel working in that bank towards everybody, towards government, towards citizens, the impact on every company, every community, every family in our country,” he said. He called on people to come forward with any information they had about what had happened in the run-up to the banking collapse and the state guarantee. Nevertheless, he continued to resist pressure to allow an independent public inquiry into the crisis. He also did not explain why no legal action had been taken against those involved in the bank fraud. He said only that it was up to the courts system to tackle lawbreakers within the banking sector. “The courts can deal with those whom they find, or whether there are charges made, against people,” he said.